Peanuts’ Citizen Kane “Rosebud” Strip Is Still The Greatest Spoiler Ever Told | "DESTROY ALL FANBOYS!" I finally saw it in the 80’s at a Public Library that had a borrowed print and although excited, I was also a bit wary because of the spoiler and how it would affect my enjoyment of the movie. As soon as the film started and a dying Charles Foster Kane whispers “Rosebud”, I actually laughed out loud because I realized that Schulz (through Lucy Van Pelt) didn’t actually “spoil” the film at all with that strip. I still had to watch the entire thing just to see what the hell Kane meant by that cryptic opening word because the significance doesn’t become truly clear until near the finale (and in later viewings, a bit earlier). By then, I’d forgotten all about being annoyed about knowing, but I do recall afterwards walking out of the library and overhearing a couple who’d seen the same strip wondering why Schulz would go and ruin such a fantastic film. To each his or her own, but I actually liked Schulz’s other movie-related Peanuts strips over the years. This entry was posted in DAF, Updates and tagged 1968, 1973, 2013, Charles M. Schulz, Charlie Brown, Citizen Kane, Classic Film, Comic Strips, Comics, Commentary, Humor, Movies, Peanuts, RKO Radio Pictures by geelw. Bookmark the permalink. Bahaha! 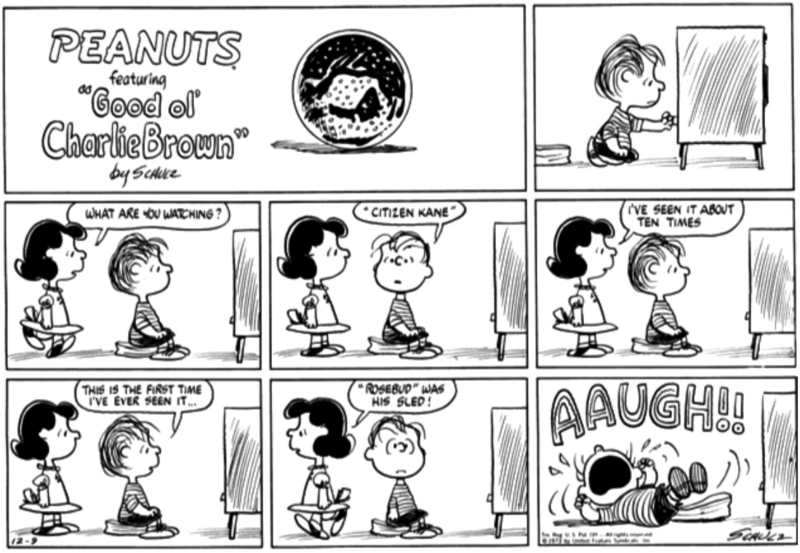 I didn’t know these Citizen Kane spoilers were in Peanuts. Beautiful! Those comics scarred me for life! Okay, not really. I can’t recall if anyone else has done that in the same way, but I’ve seen spoilers in strips used to comment on how obvious more modern movies are (as in the trailers that give away everything in 3 minutes or less, ugh). “Citizen Kane” was Schulz’s favorite movie (as “The Great Gatsby” was his favorite book, and Andrew Wyeth his favorite artist). He occasionally referred to elements of it in his strips during the 1970’s and ’80s. Oh. I’d read that some years back (sometime in the 80’s, I think).